• Prepare an ethnic-inspired turkey glaze with fresh lime juice, orange juice concentrate, butter, chopped chipotle chiles in adobo, salt and pepper. Brush your turkey with the glaze every 5 minutes during the last 15 minutes of roasting. 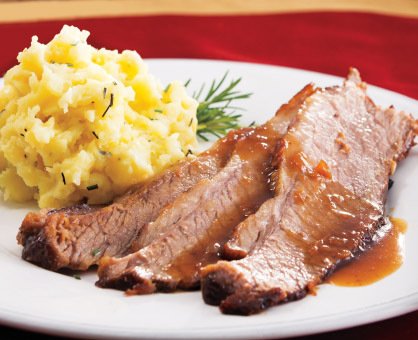 • Fall-off-the-bone braised short ribs are a great, stress-free alternative to the traditional beef roast. Season and sear the ribs in hot oil over high heat. Then, slowly braise them in a mixture of beef stock, red wine, garlic and fresh rosemary. • A crown roast of pork always says “special occasion.” Season the roast with a mixture of garlic, fresh rosemary, fresh sage and olive oil. Fill the center with a pear and chestnut stuffing made with sourdough bread, chestnuts, pears, bacon, celery, onion, fennel, garlic and dried cranberries. • A simply seasoned whole roasted chicken is always a quick and easy option for those that are short on time. Sprinkle the chicken cavity with minced garlic, fresh lemon juice, salt and pepper. Then rub a mixture of olive oil, lemon zest, fresh lemon juice, garlic, fresh thyme, salt and pepper over the outside before roasting. • Instead of a whole turkey, why not stuff a boneless turkey breast for an elegant entrée? Use a mixture of sautéed onion, garlic, fresh oregano, fresh spinach, crumbled feta cheese, salt and pepper. • For a lighter option during the holidays, a poached salmon fillet is ideal. Poach fillets in water, white wine, fresh dill, lemon and salt. Serve with an herbed mayo-sour cream mixture for dipping. • Try butterflying and stuffing a pork loin with prepared stuffing mix, apples, dried cranberries and fresh rosemary. • A holiday ham is perfect for a brunch setting. Brush your ham with a glaze made with orange marmalade, fresh orange juice, balsamic vinegar, Dijon mustard, orange zest, pumpkin pie spice, whole grain mustard and light brown sugar. • For an out-of-the-ordinary holiday meal, cook up a pot of jambalaya. Use your favorite seafood, like shrimp, clams, mussels and fish, and your favorite meats, like chicken, turkey or ham, along with rice, tomatoes, onions and green peppers. Spice it up (or not) to your liking. • Stuffed squash is a great vegetarian-friendly main dish. Stuff and roast acorn squash halves with wild rice, carrots, celery, peas, mushrooms and slivered almonds. • Want to just sit back and enjoy the season without too much fuss? Classic chicken fried steak with mashed potatoes and corn on the cob fit the bill.